Biopsy studies of metabolically-active tissues including liver, skeletal muscle and adipose tissue have helped delineate important aspects of the etiopathogenesis of diabetes and related cardiometabolic disorders. Tissue biopsy may also play a role in the development of new drugs. The most prominent example is the central place of liver histology in the assessment of efficacy and safety of new pharmacotherapies for nonalcoholic fatty liver disease (NAFLD)/nonalcoholic steatohepatitis (NASH). Several drugs are currently in phase 3 trials for this indication that involve paired liver biopsies. 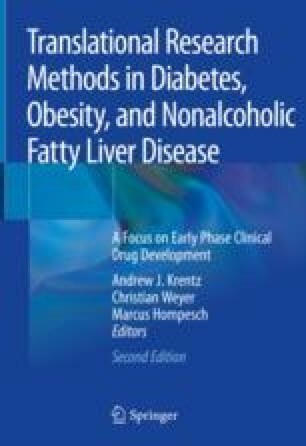 Stefan N, Haring HU, Cusi K. Non-alcoholic fatty liver disease: causes, diagnosis, cardiometabolic consequences, and treatment strategies. Lancet Diabetes Endocrinol. 2018. https://doi.org/10.1016/S2213-8587(18)30154-2. Parikh ND, Marrero WJ, Wang J, et al. Projected increase in obesity and non-alcoholic-steatohepatitis-related liver transplantation waitlist additions in the United States. Hepatology. 2017. https://doi.org/10.1002/hep.29473. Lee Y, Doumouras AG, Yu J, et al. Complete resolution of nonalcoholic fatty liver disease after bariatric surgery: a systematic review and meta-analysis. Clin Gastroenterol Hepatol. 2018. https://doi.org/10.1016/j.cgh.2018.10.017. Jahn D, Kircher S, Hermanns HM, Geier A. Animal models of NAFLD from a hepatologist’s point of view. Biochim Biophys Acta Mol basis Dis. 2018. https://doi.org/10.1016/j.bbadis.2018.06.023. Thyagarajan B, Foster MT. Beiging of white adipose tissue as a therapeutic strategy for weight loss in humans. Horm Mol Biol Clin Investig. 2017. https://doi.org/10.1515/hmbci-2017-0016. Stanford KI, Goodyear LJ. Muscle-adipose tissue cross talk. Cold Spring Harb Perspect Med. 2018. https://doi.org/10.1101/cshperspect.a029801. Dinas PC, Valente A, Granzotto M, et al. Browning formation markers of subcutaneous adipose tissue in relation to resting energy expenditure, physical activity and diet in humans. Horm Mol Biol Clin Investig. 2017. https://doi.org/10.1515/hmbci-2017-0008.